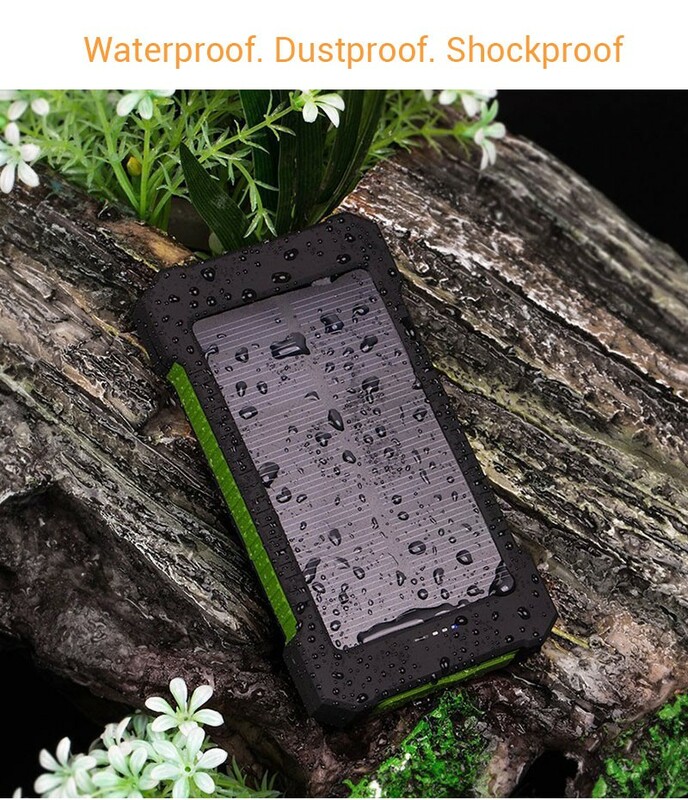 External Portable Charger Power Bank Specially Designed for Outdoor! Special Design for Outdoor. Compact design and with a hook + Carabiner, so you can freely attach it to your backpack in camping, and it will recharge itself under direct sunshine for the emergency. Dual USB Outputs: 5V/1A and 5V/2.1A USB ports for iPhone,iPad/Tablets, Android phone and other smartphones or other electronic devices. 5V/2.0A USB input for fast charge solar power bank itself. Allow you to charge two devices at the same time, the Solar power charger provides great convenience to you and your friends who need charging services. LED Flashlight & SOS Function: Built-in bright LED can be used as a torch, or as an emergency lighting in darkness, the flashing light mode can be used as SOS. Widely Used: Compact design and with a hook + Carabiner, so you can freely attach it to your backpack in camping, and it will recharge itself under direct sunshine for the emergency. Warm Tips: The solar panel is meant to be used in emergency and extends the battery life due to its small capacity. Please don’t take solar as the main power source, which may take a long time to charge. cool and quality humdinger. class works. it is the moscow 25 days. until all good. excellent quality, very like, very credit! really super full, thank you very much seller! bank excellent! and whole дошло all no problem. this seller advice!